From Goodreads: In the violent country of Ludania, the classes are strictly divided by the language they speak. The smallest transgression, like looking a member of a higher class in the eye while they are speaking their native tongue, results in immediate execution. Seventeen-year-old Charlaina has always been able to understand the languages of all classes, and she’s spent her life trying to hide her secret. The only place she can really be free is the drug-fueled underground clubs where people go to shake off the oppressive rules of the world they live in. It’s there that she meets a beautiful and mysterious boy named Max who speaks a language she’s never heard before . . . and her secret is almost exposed. Charlie is intensely attracted to Max, even though she can’t be sure where his real loyalties lie. As the emergency drills give way to real crisis and the violence escalates, it becomes clear that Charlie is the key to something much bigger: her country’s only chance for freedom from the terrible power of a deadly regime. As a fan of both The Body Finder and Desires of the Dead, I’ve come to trust Kimberly Derting to not only tell a compelling, exciting, beautifully written story, but to throw in a few surprises as well. The Pledge did not disappoint! ~ The World Building – The Pledge‘s language-based class system is fascinating and well thought out. As each layer of Charlie’s society was unveiled, I found myself more and more impressed with uniqueness of the overall concept and the details Kimberly Derting infused into her book’s world and back story. ~ Chemistry(!) – Charlie is highly likable, and love interest Max is an obvious hottie. While their attraction is fairly immediate (something that often bothers me in YA lit), I bought into it here. Their interactions are highly charged and often dangerous, yet there’s a tenderness between them that helped me feel their connection and, in turn, love the scenes they shared. ~ The Fairy Tale Factor – While The Pledge is a clear dystopian, it has many fairy tale elements. The battle between good and evil, a truly heinous villain, royalty, magic (yes, magic! ), and the exploration of universal truths and themes. I loved the fairy-tale-esque spin on the tried and true dystopian backdrop, and thought it lent an air of individuality to the story. ~ The Regal Voice – I found Kimberly Derting’s authorial voice in this book to be slightly different from that of The Body Finder series. There’s a certain sophistication here that works, especially since royalty and class are such an important aspect of The Pledge. ~ Angelina – Charlie’s little sister is an enigma. At only four, she exudes an air of wisdom and grace I thought was intriguing. She doesn’t speak (which is huge in a society where languages are defining), yet she was one of the most interesting characters in the book. 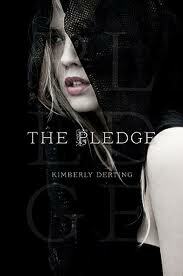 ~ Closure – According to Goodreads, The Pledge is the first in a trilogy. While there’s some set-up for future books, I felt a sense of closure upon reading the final pages. No frustrating cliffhanger, no “To Be Continued…” The Pledge stands alone as an exciting, twisty, unique story. That said, I’m definitely looking forward to reading the rest of the trilogy! Oh, and one more super important note: My fellow Bookanista and agent sister Carolina Valdez Miller is going on a medical mission trip to Haiti this January and needs your help. Please consider donating to this very worthy cause! Yes, the fairy tale elements matched with the dystopian setting worked really well together. They gave the story a definite twist on what I’ve come to expect from this genre. If you like THE PLEDGE, definitely check out Kimberly Derting’s THE BODY FINDER and DESIRES OF THE DEAD. Both very cool! I’m looking forward to reading this one- the cover is awesome, and fairy elements + dystopian setting? I’d like to see how it works out! I LOVE the cover! Not usually drawn in by the facial close-ups, but I think this one is beautiful. Let me know what you think after you finish reading! Great review, Katy! I’ll definitely have to check out this one!